Hello, and welcome back to our blog here at Dynamic Measurement and Control Solutions. This is part two of our blog series about implementing automation systems into your manufacturing company. Last time, we covered some important topics including finding a balance between employee processes and machines, narrowing the focus of your system, working with legacy automation systems, and complying with OSHA safety regulations. Keep reading to learn more about implementing automation systems into your company and contact Dynamic Measurement and Control Solutions today if you have any questions. 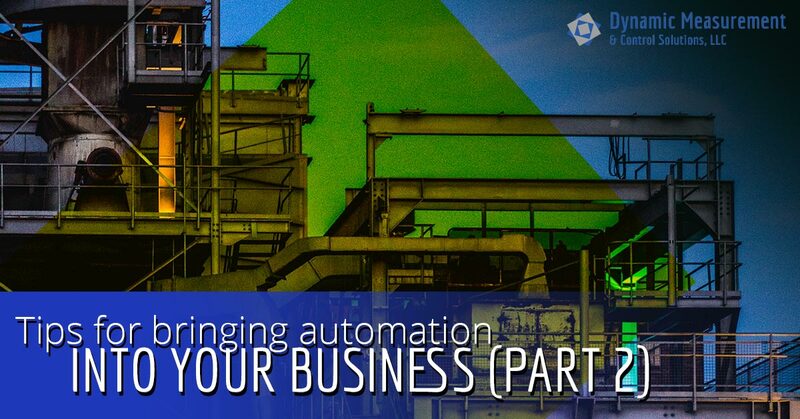 As with anything that you implement into your business, automation will cost you. But that doesn’t have to completely break the bank. Depending on your industry and company, it may be more practical to implement automation gradually rather than all at once. Try locating one small part of your company and replacing it with automation. Once you’ve tested the waters, you can start to branch out into the rest of your company as your budget allows it. An important part of planning your budget will be understanding your return on investment. You should start by estimating the time/cost savings of automating versus not automating. Will you be able to recover from your investment? Have you accounted for errors in software or machinery and how that will play into your overall budget? Chances are, you’re already planning for the short term. You’ve calculated how much it will cost to implement the automation, spoken with employees about what processes can be improved, and determined how it will fit into your overall business structure. But have you thought about the long-term impact of your decision? Will this automation technology have the capacity or means to grow with your company? Is there a new technology releasing in a year that will make your system obsolete? How will you train your employees differently as a result of the new automation? These are all questions you should answer before you go any further. It’s inevitable that your new automation technology will introduce new faults like glitches or security risks and it’s in your best interest to understand these as soon as possible and be ready for anything and everything to go wrong. You should have your system inspected regularly for quality assurance and always be looking for ways to improve upon your original design. DMCS is your full-service engineering consulting firm in Northern California. With 20 years of experience, we’ve worked with companies of all different sizes and industries. We understand that as a business owner, you know what your company needs, you just might not know exactly who you need to contact to get you there — that’s okay! Give us a call today and we’ll save you time and money by matching you with the products and services you need to implement automation in your company.